The Salts Play Area – Open for the holidays! 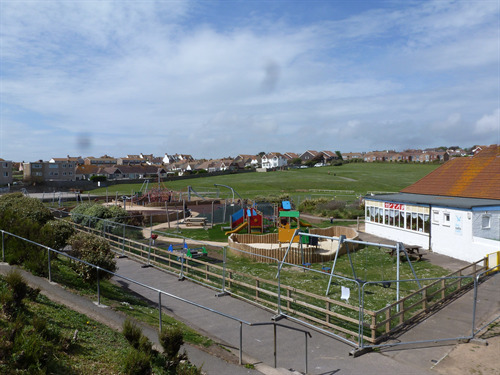 Seaford Town Council is pleased to announce that the children’s play area at The Salts Recreation Ground will be open for the May school holiday. Due to the timing of various landscaping works the play space will be open for all to enjoy over the holiday week with works resuming from week commencing 6th June. A variety of improvements have already been undertaken and the play space is well on its way to conclusion with work booked in for the installation of rubber safety surfacing around more of the equipment. With approximately two more weeks of work ahead of them, not including the holiday week, the new management team and landscaping contractors are pleased be able to correct the original works as well as upgrade many of the surfaces to create an enjoyable park for all year round. After the holidays the Council will ensure that parts of the park continue to remain open at any given time for the remainder of the works. Also don’t forget to enjoy the other facilities at The Salts; there’s the Skate Park, Basketball Court, 5-a-side and Outdoor Gym, or the vast open spaces to use, which remain open to the public, all free of charge! The Salts Café is open 7 days a week where you can hire the Tennis Courts and equipment during opening times and the courts are free to use outside of the Café opening hours. Look out for further information on the developments by visiting Seaford Town Council’s website or liking their Facebook page.